OhioHealth, Avita Health System, and University Hospitals are continuing to stake out positions all across Richland County and the surrounding area. 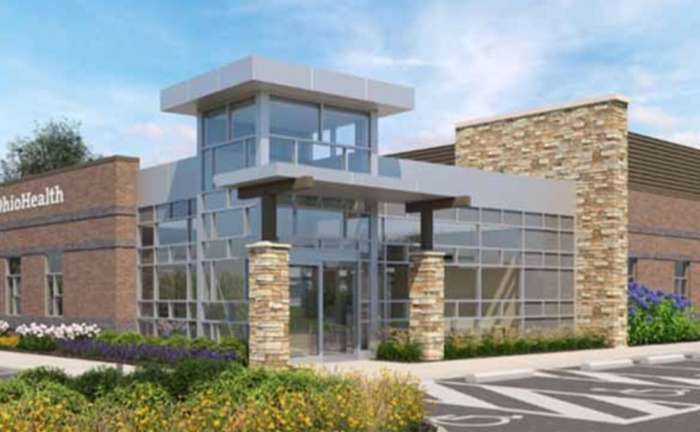 On Tuesday, OhioHealth announced plans to locate a $5 million medical office building on Route 42 in Lexington (rendering above). The 10,000 square foot facility, which will be near Lakewood Road, will house multiple services. Included will be the new home for the OhioHealth Physician Group Primary Care practice, which includes Brandon Crouch, MD; Lisa Patterson, NP; and Elisabeth Mill, MP. That practice will move from its current location on Main Street in Lexington. Then on Wednesday, University Hospital broke ground on a $17 million facility in conjunction with the Samaritan Medical Center on Ashland Road in the Madison area (see images below). Designed by CBLH Design Inc from Cleveland, Ohio, the two-story building’s first floor will house urgent care, laboratory, radiology, physical therapy and community spaces for educational needs, including screenings. The second floor of the medical facility will feature office suites for specialists and physicians. Avita Health System opened its most recent facility just this past August. And, as we shared earlier on 1812Blockhouse, Akron Children’s Hospital is opening its new center on Trimble Road this month.